Throughout the centuries, peoples born in the area known as sub- Saharan Africa have interacted on many levels with peoples from elsewhere. 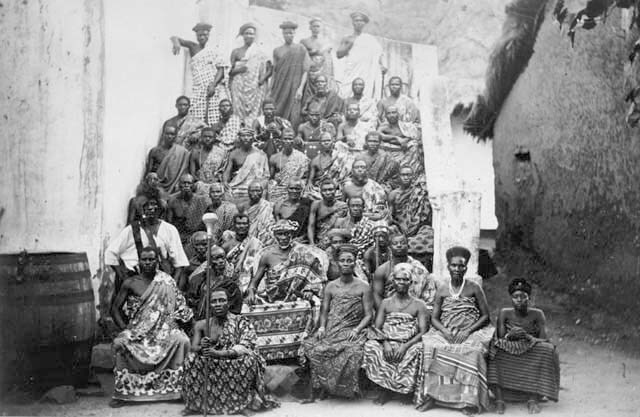 The Library of Congress Africana collections are rich in primary documents, facsimiles, and secondary sources in a variety of languages and formats that describe these experiences. Texts, maps, visual images, artifacts, and recordings document the observations of non-Africans as they traveled to parts of the continent and of Africans who encountered them willingly or under coercion. These materials also describe the resistance and adaptation of Africans to the cultural and political onslaught of non-Africans. Diverse resources are available to study the development of commercial and diplomatic relations; the creation and dissolution of colonial governments; and the reestablishment of sovereign nations. 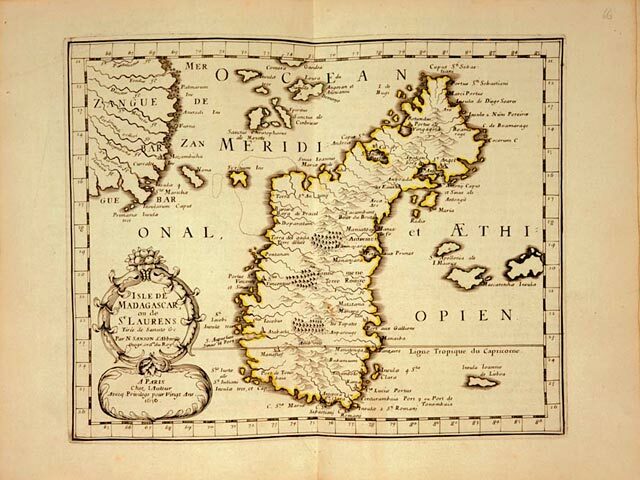 Some of the earliest writings mentioning African peoples describe the relations between the peoples of the Horn of Africa and peoples living in Egypt, on the Arabian peninsula, or in India, where an active trading network across the Red Sea and the Indian Ocean was already well established in ancient times. 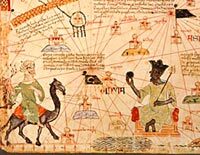 In West Africa, kingdoms such as Ghana, Mali, and Songhai engaged in trans- Saharan trade with North Africa as early as A.D. 300, flourishing particularly in the Middle Ages. The Library has many accounts of these historic encounters in the original languages -- Chinese, Arabic, and others -- of the observers as well as in various translations. "A New Map of the Coast of Guinea from Cape Mount to Iacquin" appeared in William Smith's Thirty Different Drafts of Guinea (not before 1727), which illustrates the fierce competition among the Dutch, English, and Portuguese along the west coast of Africa in areas they called the Grain, the Ivory, the Gold, and the Slave Coasts. 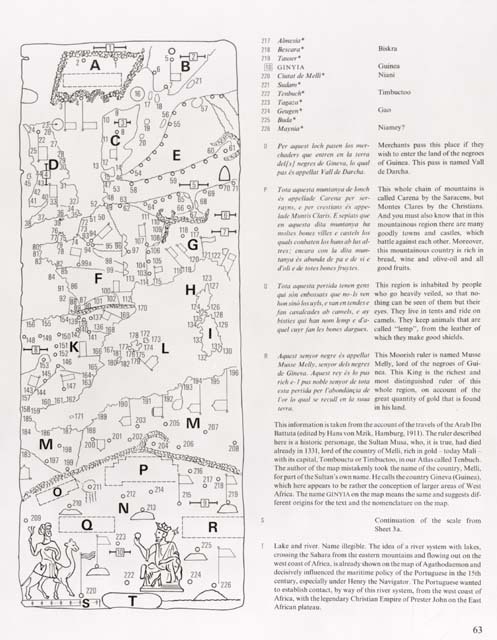 The volume includes diagrams of the forts they built, landscapes, and pictorial information that sheds light on the slave trade. Travelers to and from Africa, whether they were traders, government or military officers, or people returning to Africa after the diaspora, have produced descriptions of their experiences. In the Manuscript Division, the Naval Historical Foundation collection and the Peter Force papers contain the records, correspondence, logbooks, and maritime reports of many American naval and merchant seamen who sailed the coasts of Africa and described the social, political, and economic conditions observed. In the same division are found the papers of other American travelers, such as those of the abolitionist, diplomat, journalist, and orator Frederick Douglass (1817?-1895), who traveled to Africa in 1845-47 and 1886-87. The papers of W. E. B. Du Bois (1868-1963), author, educator, and historian, describe his travels in Africa and are available on microfilm. African travelers to the United States and other countries have described their experiences and views of those areas. Recent examples include Prince Bamgbola Akinsanya's America! : Candid Impressions of an African: A Comparison of Two Cultures (1992) and H. Martin Th. Kayamba's An African in Europe (1948), both housed in the General Collections. Some of the writings of Africans captured in slavery reside in the Library's Rare Book and Special Collections Division. 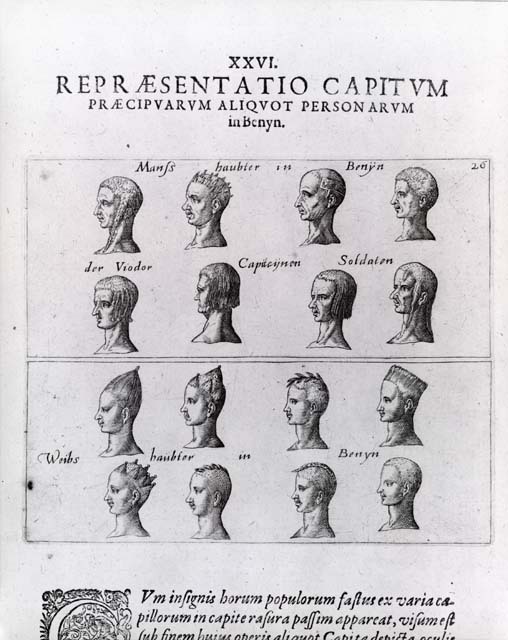 Among them are first and subsequent editions of the Thoughts and Sentiments on the Evil and Wicked Traffic of the Slavery and Commerce of the Human Species (1787) by Ottobah Cugoano (ca. 1745-ca. 1790), said to be from Ghana originally. Nigerian Olaudah Equiano (ca. 1745-ca. 1802) wrote his autobiographical Interesting Narrative, which was published in 1789. One of the earliest African American poets, Phillis Wheatley, born in the Senegal River valley in about 1753, is known for her Poems on Various Subjects, Religious and Moral (1773), part of the John Davis Batchelder Collection. "Isle de Madagascar ou de St. Laurens" is by the French geographer Nicolas Sanson, whose L'Affriqve; en plvsieurs cartes novvelles, et exactes; & en divers traitez de geographie, et d' histoire (1656), is one of the earliest atlases in the Library of Congress devoted exclusively to Africa. Sanson includes extensive descriptions of the continent and its peoples. One of the largest Africana collections in the Library is that of the American Colonization Society. The finding aid The American Colonization Society: A Register of Its Records in the Library of Congress (1979) guides the researcher through these documents, which number 190,000 pieces. Formed in 1817 and dissolved in 1964, the society was established to facilitate the repatriation of African Americans back to Africa, first in Sierra Leone and then principally in Liberia. The ACS archives included photographs and postcards (now housed in the Prints and Photographs Division); correspondence, internal reports, and other official documents (in the Manuscript Division); and maps (in the Geography and Map Division). Some of these materials are available electronically through the Internet as part of the American Memory project accessible from the Library's Web site. Materials that complement the American Colonization Society collection include Daniel Coker's journal of 1821 (housed in the Manuscript Division), which records daily events at the society's colony at Fourah Bay, Sierra Leone, where Coker served as its agent. Consisting of nearly four hundred pamphlets, the Daniel Murray Pamphlet Collection, housed in the Rare Book and Special Collections Division, has also been partially digitized and is accessible on the Internet. Daniel A. P. Murray was a valued Library employee for many years who spent a lifetime assembling his personal collection of mostly African American studies materials, which was bequeathed to the Library after his death in 1926. Among the digitized pamphlets is The Foulahs of Central Africa, and the African Slave Trade (1843). Johann Theodor de Bry (1561-1623?) in his India Orientalis pars VI. 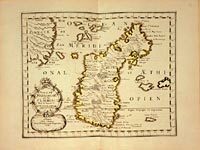 Veram et historicam descriptionem avrifeie (1604) provides an excellent example of the type of book published in Europe about the African continent to astound and amaze Europeans in the seventeenth century. 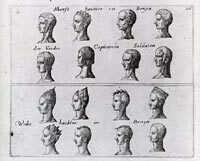 Pictured here in profile are eight men and eight women of Benin whose hair styles resemble some still popular today in Africa as well as in the diaspora. The early history of African-European government relations is documented in the work of Jacobus Philippus Bergomensis (1434-1520). His Supplementum chronicarum (1486) contains a partial account of the treatise written by Giovanni da Carignano based on interviews Carignano supposedly conducted with members of the diplomatic mission sent by King Wadem Ar'ad of Ethiopia to the papal court in Avignon in A.D. 1306. In several anthologies and translations in the Library's collections, the correspondence exchanged between Afonso I, king of the Congo (ca. 1456-ca. 1541) whose prebaptismal name was Mvemba Nsinga, and Manuel I, king of Portugal (1469-1521), is available. In 1884-85, the Berlin Conference brought together delegates from Austria, Belgium, Denmark, France, Great Britain, Italy, Luxumbourg, Netherlands, Portugal, Prussia, Russia, Spain, Sweden, and Turkey to discuss the competitive interests of each for colonies in Africa. The map of Africa soon reflected the agreements made at this conference and ushered in the colonial period of African history. The establishment of colonial administrations generated many documents and publications. 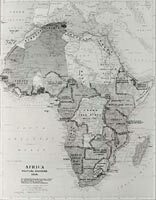 The African Section has prepared a series of guides to official publications of these governments and to those of the subsequent independent nations (see "Selected Library of Congress Publications on Africa"). In this same period, many Catholic and Protestant missionaries were sent to the continent to convert and educate the African peoples and to inculcate Eurocentric culture in them. Microfilmed archives of some of these societies are held by the Library, for example, the imc-cbms Missionary Archives (1977), a collection of about 1,850 microfiches concerning the International Missionary Council and the Conference of British Missionary Societies. These archives cover the period from 1910 to 1945 and are available in the Microform Reading Room. 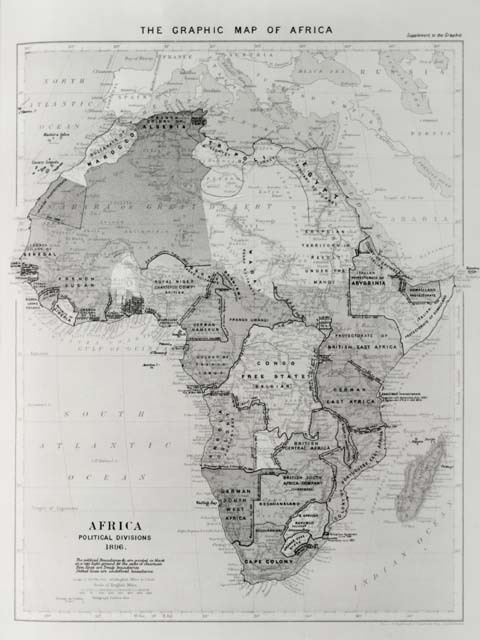 Aaron Arrowsmith's To the Committee and Members of the British Association for Discovering the Interior Parts of Africa This Map Is with Their Permission Most Respectfully Inscribed (1802) and, above, Edward Stanford's Stanford's Library Map of Africa; New Edition (1896), drawn respectively at the beginning and at the end of the nineteenth century, graphically show the results of a century of European exploration and colonization. Arrowsmith, the leading nineteenth- century British map publisher, strove to produce maps with the most accurate information possible, most of the data coming directly from explorers and travelers. Stanford is known for his publication of maps widely used in schools and libraries. The resistance of Africans to the cultural and political assault of the Europeans is also documented in the Library's collections. The Mombasa Rising against the Portuguese, 1631: From Sworn Evidence (1980) presents in English translation the "Diocesis Goanae Processus martyrum de Mombassa," a record of the court of inquiry held by the diocese of Mombasa to ascertain whether those who died during the rebellion were martyrs and eligible for canonization as saints. The testimonies of eyewitnesses give the historian views of the confrontation between Islam and Christianity and between African and European political powers. Their accounts provide an insight into the social and cultural interactions of peoples living in the Mombasa, Kenya, area of Eastern Africa in the seventeenth century. Labeled "King Kobina of Elmina, Ghana" (ca. 1890s), this photograph is one in a collection dated 1890-1910. Here the royal court is portrayed in traditional dress surrounding the king. In the same collection is a photograph showing some of the same people, but wearing Western clothing and posed more informally under some trees. (Frank and Frances Carpenter Collection. The Library offers researchers a dazzling array of graphic resources that portray the ways in which Africans were viewed by others and how Africans saw themselves and other peoples. These materials include drawings reproduced as etchings and lithographs in books, newspapers, or periodicals, as individual images such as photographs and daguerreotypes, or as films and videotapes. In David Killinray and Andrew Robert's essay, "An Outline History of Photography in Africa (to c. 1940)," in Photographs as Sources for African History (1988), it is noted that "In South Africa, studios were established in the Cape in the late 1840s and 1850s. . . . In Luanda [Angola], a studio opened around 1863. During the 1880s there were at least seven studios in Freetown [Sierra Leone] run by black photographers, and by this time there were also studios in Accra and Zanzibar" (p. 10). The Red Book of West Africa: Historical and Descriptive, Commercial and Industrial Facts, Figures, & Resources (1920) contains the photographs of the following photographers: George S. Da Costa of Nigeria; N. Wlawin Holm who was born in Accra, had a studio in Lagos, and was the first Nigerian member of the Royal Photographic Society of Great Britain; and Alphonso and Arthur Lisk-Carew of Sierra Leone. The volume claimed to be "the first of its kind ever issued on West Africa, also the most profusely illustrated." From the 1870s through the 1930s, stereograph companies deposited more than 250,000 stereograph cards for copyright in the Library of Congress, of which approximately 2,500 show African scenes. Arranged geographically in file cabinets, these stereographs show details of life in various parts of the continent, such as the court in session in a courtroom filled with officials, audience, and witnesses pictured in A Native Court in Ujiji, Tanganyika Territory, Africa (P&P stereo. no. 20767). Other photographic collections include the Royal Commonwealth Society's rcs Photograph Collection: Africa (1985-87), found in the Microform Reading Room, consisting of 208 microfiches which document the colonization and administration of former British colonies in Africa. The photograph albums of Frank G. Carpenter (1855-1924), the American author and journalist who traveled all around the world during a period of over thirty years, are housed in the Prints and Photographs Division. Carpenter wrote about and photographed many African countries -- including Uganda, Rhodesia, Mozambique, and the Union of South Africa. Early Motion Pictures: The Paper Print Collection in the Library of Congress (Washington: Library of Congress, 1985) describes two moving pictures apparently filmed on location in Africa, although the country is not designated for either. Military Drill of Kikuyu Tribes and Other Native Ceremonies was deposited for copyright on July 4, 1914, and Paul J. Rainey's African Hunt on April 22, 1912. For a number of works, the Library owns both a set of photographs that was compiled for publication and the published book itself. 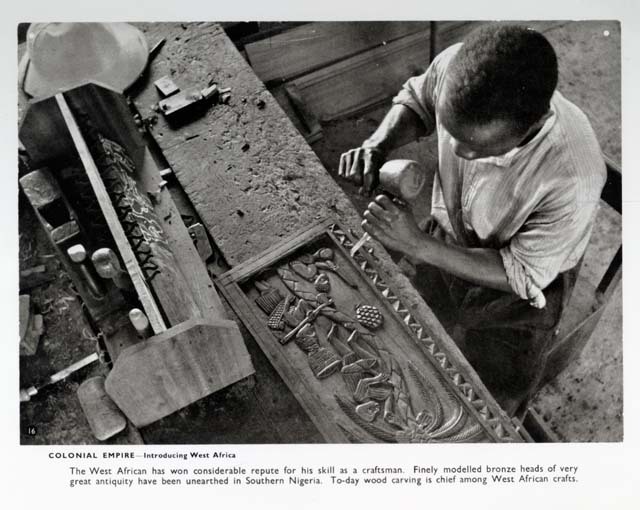 Introducing West Africa, issued by the Great Britain Colonial Office and the Central Office of Information in several editions from 1944 to 1955, included a photograph whose original legend read in part, "The West African has won considerable repute for his skill as a craftsman. . . . Today wood carving is chief among West African crafts." 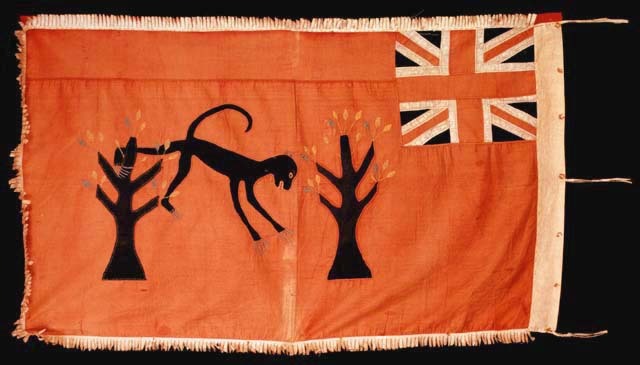 Promotional works such as this were issued by colonial governments to encourage tourism and settlement in their colonies. 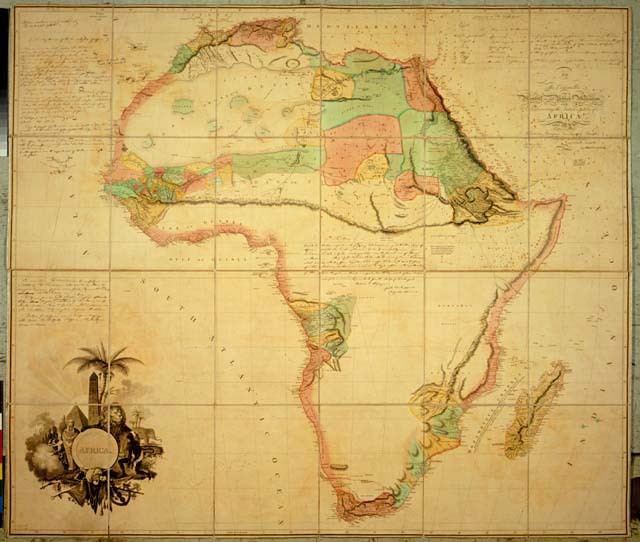 The Library has the world's largest collection of maps and atlases, including many of interest to the Africanist. 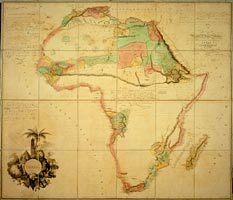 From ancient hand-drawn charts to the latest satellite surveys, the Geography and Map Division houses more than 150,000 maps and atlases on Africa, offering diverse types of information such as political and geographic divisions, environmental conditions, and ethnological data. 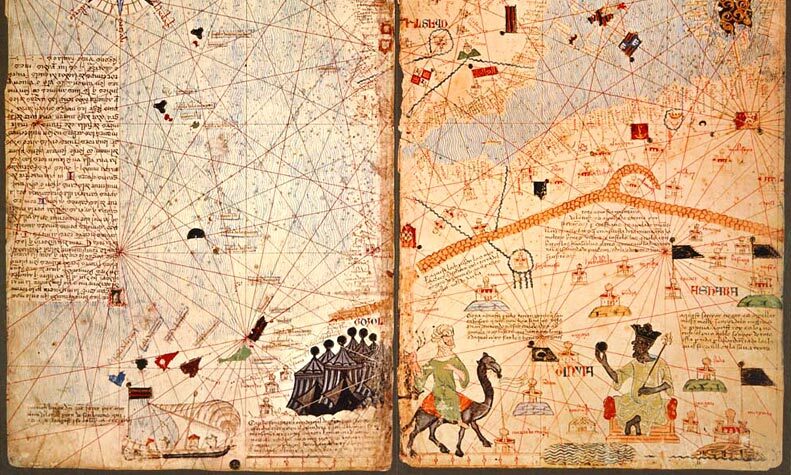 For example, the collection includes the 1477 Bologna edition of Claudius Ptolemy's Geography, based on Ptolemy's writings of about A.D. 150 and on what was known from Arab and European writers up to 1477. Maps are often found in travel accounts. A map of West Africa drawn for the benefit of a European traveler at the command of Muhammad Bello, sultan of Sokoto (d. 1837), was published in 1826 in Narrative of Travels and Discoveries in Northern and Central Africa, in the Years 1822, 1823, and 1824 by Dixon Denham, Hugh Clapperton, and Walter Oudney, who were travelers and explorers in that region. The historic complexity of the encounters between African peoples and others has produced a multiplicity of materials. The Library's Africana collections offer researchers a wide selection of resources reflecting a variety of approaches to documenting these interactions.